This mountain is south of Osaka. Locate, for example, the community Kashihara, and more importantly, Hwy. 169 that heads south into and across the mountains. Take this road, way up in the mountains, you will note that the Hwy. makes a loop (bridge + tunnel), in order to gain elevation. Shortly after this, drive through a tunnel that crosses the main mountain crest. About 3 kilometer after exiting this tunnel, pay attention as you need to make a sharp right fork onto Hwy. 309, a much smaller, narrow road that will climb back up to the main crest in a separate valley. After many twisting curves, this narrow road finally (about 10 km) crosses the main crest in its own tunnel. Immediately when you exit this tunnel, there is parking on your right hand side. This is pay parking, 1000 Yen for a day in 2016. This is the trailhead, location N34.18851, E135.93719, elevation about 1135 meter. Cross the road and pick up the large and well maintained trail that starts there. This trail first heads into a small valley, fairly flat, then starts climbing until it reaches a trail junction at the very top of the main crest. Turn right, you are now on a famous pilgrim trail that dates back many hundred years. This trail is also designated a UNESCO world heritage. 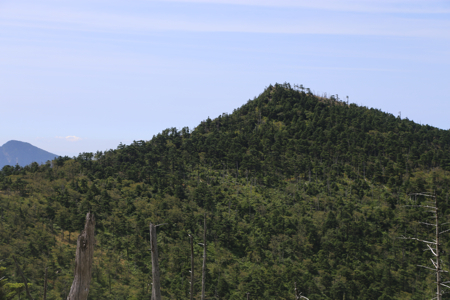 The trail runs nicely on top of the main ridge to a local top near 1600 meter, then descends about 50 meter to a broad lower col before ascending more steeply to reach the top called Misen at 1895 meter. There are several buildings here. To get to the highest summit, a trail forks left (at 90 degrees) just next to the buildings among some larger trees. This trail first descends about 80 meter to a wide saddle, before a final ascent to the summit. We left the trailhead at 0815. The trail was nice and we arrived at the 1895 meter summit Misen without much effort. At Misen, we managed to try two different wrong trails before some concentration made us continue on the obvious summit trail. We arrived at the summit at 1015. We stayed around for 20 minutes, then hiked back to the car in 1:40.